Looking for A Predictive Dialer? Predictive dialers are one of the most well-known types of dialer software – not just by the companies who use them, but by anyone who has ever received a phone call placed by one. But is a predictive dialer really the right dialer for you? A predictive dialer uses multiple lines to move through a large volume of leads, and routes answered calls to the first available agent. The contact’r;s information pops up on the agent’r;s screen as the call is routed to them. The software uses an algorithm – one that factors in the total number agents, average length of call, percentage of live answers and other metrics – to &OpenCurlyDoubleQuote;predict”r; how many lines it should dial at once so that an agent will become available when a call is answered. The value of a predictive dialer is its ability to distinguish between a live answer and a machine. This time-saving determination frees agents from having to spend time waiting for a human to answer. That allows for a significant volume of calls to be placed with fewer agents, and less time invested. A predictive dialer’r;s biggest selling-point is also its biggest limitation. It has become infamous for its telltale &OpenCurlyDoubleQuote;telemarketer delay”r; – the off-putting dead air that follows &OpenCurlyDoubleQuote;hello”r; as the contact gets routed to an available agent. This pause results in hang-ups, and negatively impacts the agent’r;s ability to have a high quality conversation. For this reason, when success is measured by productive live interactions (sales or fundraising, for example) a predictive dialer may not be adviseable. A delay-free power dialer is a better option. Another disadvantage of predictive dialers is that they inherently result in dropped calls – which can put your organization at risk of fines and penalties. Unavoidably, some calls are answered when an agent is not available. When this occurs, the call recipient says &OpenCurlyDoubleQuote;hello”r; but gets no response until ultimately, the call is terminated by the software. The FCC strictly regulates the use of multi-line dialers, such as predictive dialers. If an organization – with a few exemptions including non-profits – drops more than 3% of calls, they may be in violation of the TCPA (Telephone Consumer Protection Act). The FCC imposes fines of up to $11,000 per incident. Due to the complexity and potential for heavy fines for unintended misuse of predictive dialers, it’r;s recommended to consult your attorney prior to use. Looking to make a lot of outbound calls, efficiently and effectively? It’r;s time to explore a customer-friendly, delay-free alternative to predictive dialer software. PhoneBurner’r;s &OpenCurlyDoubleQuote;power dialer”r; powers thousands of clients and millions of phone calls every month – with delay-free connections that ensure calls start off with maximum sales and conversion potential. 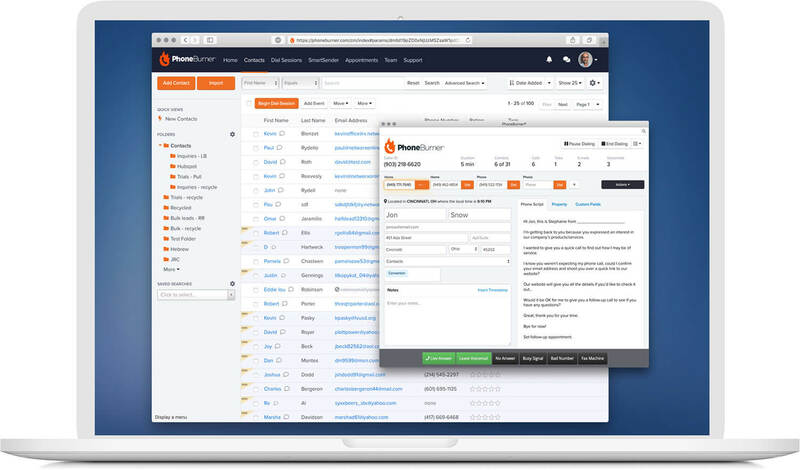 PhoneBurner is fully customizable to fit any outreach process, and streamlines dialing, voicemail, email, call-logging, and more, to help agents reach up to 80 contacts per hour. Just focus on talking to live prospects. PhoneBurner handles the rest. Plus, unlike users of auto and predictive dialers, PhoneBurner users do not risk incurring TCPA fines and penalties for dropped calls – which do not occur with our software. No contracts. No setup fees. Start your free trial without a credit card today.